At last, there is relief for painful knees that you can use in the comfort of your own home, any time of the day or night. The knee therapy wrap is filled with buckwheat which is a really effective material for absorbing the temperature of its surroundings. It also means that the wrap is flexible and will conform fully to the shape of your knee for the most effective treatment. There is a velcro fastening which means this knee wrap can be work tight for the best in support, or loosened off for tired and swollen knees. This knee wrap is a perfect fit - to how your knees feel at that moment. Hot therapy to the knee helps to relax stiffness, improve flexibility and relieve pain. Heat therapy stimulates your body's own healing force and when applied via this knee wrap you are directing the heat right at the problem area. So how does heat therapy work? Heat dilates the blood vessels, stimulating blood circulation thereby reducing muscle spasms. What you'll also find is that heat actually alters the sensation of pain. You can use heat in all manner of ways, but with this knee wrap, you'll find the heat is directed right where you need it. If you were to use something like a hot water bottle, it can be bulky, burn, and not mould to the shape of the knee to give an effective enough treatment. You also need it give it time to work, using heat therapy 15 minutes before exercise such as walking will help to ease the stiffness and improve circulation to get you going again.You should also use heat therapy after any form of exercise. Obviously if you have arthritis or rheumatism you can benefit from hot therapy to your knee at any time, or you may prefer cold therapy to reduce the swelling. Cold therapy helps to decrease swelling in the knee, reducing inflammation and easing pain. 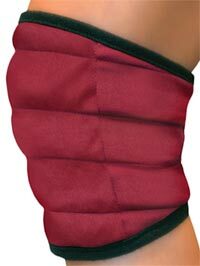 If you decide to use your knee wrap to deliver cold therapy use it as a cold compress. It will help to reduce swelling by constricting the blood vessels. You might find that initially cold therapy is a little uncomfortable at first, but you will then notice that it can numb deep pain. Cold therapy is particularly useful for arthritis pain or an arthritis flare up. Hot or cold therapy for a sporting injury? If you have a new injury that is red, swollen, or inflamed, then cooling the injury should to help prevent inflammation. So, if the pain is from a muscle injury, treat it immediately with -- rest, cold therapy compression from this knee wrap, and elevation.